The Weiss climate chamber WK 111 was designed to simulate different climates and/or seasonal climates and climate zones, in particular for long-term and accelerated stability tests. The specimens which have to be exposed to a long-term test and/or an accelerated service life test played a primary role throughout the entire development and construction. Stability tests as per the ICH guideline, climate tests in which the climate remains constant as per DIN 50 014 and IEC 60 068-2-3 and additional standards can be easily performed. 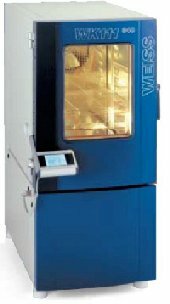 The WK 111 can also be used as a temperature test chamber. The well-designed basic units together with numerous options allows for versatility. Humidity Range 10 ... 98 % r.h.
Control system: Controller Board M!NCON/32* with Controller element Color Touch Panel.